Plants and their traditional uses. These roots were usually eaten quickly because they could not be dried. The little roots grow in clusters and are shaped like large rice grains. They are highly perishable and had to be kept moist. The best way to cook Sa-qwa-aks is in an underground steam pit. First Nations have been working to revive the plant in B.C. Spring Beauty or Claytonia- ( Sqaa- kweenum) Either boiled or roasted, this plant was one of my Grandma Mary Thomas' favorite roots. They are small and round. They could be kept in earth pits for a month or so but would not last for winter use. Tiger Lily or Lilium Lancifolium- ( Tar-Chien) This bitter tasting plant was dug in the fall and its roots were cooked in underground steam pits. Yellow Lily or (Squay-wh) - The yellow lily was as much of a part of the Secwepemc diet as potatoes are today. Yellow Lily roots are dug with a long digging stick. These roots were enjoyed fresh, roasted in hot ashes or dropped into boiling water and boiled. Also an important winter food, the plant was gathered after the leaves and flowers died off and dried for winter on racks of bark. Dried roots had to be cooked by steaming in the underground pits. Soopalallie or Shepherdia canadensis (ho-some) Known affectionately as Indian Ice Cream, these berries were collected by putting a large blanket under the tree and shaking it. Only the very ripe berries would fall off. Berries were placed in a bowl and crushed. Wild raspberries were added to sweeten the dessert and the mixture was whipped into foam and eaten like ice cream. 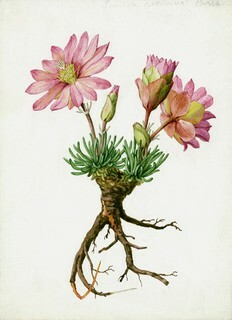 Bitterroot or Lewisia rediviva (Speetlum) " This is such a beautiful flower we hated to dig it up, but the roots were important for our winter food. We would dry lots of it, for it stored well. It was nice to eat fresh too. The most important thing in preparing this root was to be sure you peeled it right away, then the skin slipped off easily. As soon as the root got just a little bit dry it was almost impossible to peel. The skin is were the real bitter flavour came from. After the skin was off and it was cooked the flavour was something like grapefruit. The roots turn a sort of salmon pink color when they are dried. Bitter root was often cooked together with Saskatoon berries." - Mary Thomas from the book Lak-La Hai-ee Volume 1 interior Salish food preparation. Huckleberry ( Win-Ach) " This was a very important berry..... Not just because it was food, but because it was a sign of good will. If you had guests that you wanted to honour you would serve them huckleberries. These berries could be sun dried and stored so that later on they could be steamed or boiled. In the old days little bags of huckleberries would be given to departing guests. Perhaps they were special because we didn't get too many. They grew high up and were sometimes hard to find. Even today my friends in the south give me a jar of huckleberries whenever I visit them. Some people call this berry a blue berry." -Mary Thomas from the book Lak-La Hai-ee Volume 1 interior Salish food preparation. Lak-La Hai-ee Volume 1 interior Salish food preparation.